I first visited this sanctuary in the desert in the early 1990s in its heyday. My parents and a family friend decided to take me there one night on a whim. After driving for what seemed like forever through the pitch black desert, we pulled into a gravel parking lot. It was only then that the lights from inside the canyon became visible. A large wooden staircase led you down into the canyon; the Christ of the Andes statue was the first thing to greet you, and a guestbook was located at its feet at the bottom of the stairs. The ledger revealed that within the past few months, visitors from around the world had been there. Laminated placards were littered throughout the walkways with quotes from an assortment of spiritual leaders, philosophers, and world leaders. There were wooden benches to sit on while meditating, praying, or just to relax on in this Eden in the Desert. There were no night watchmen or entrance fees and it was open twenty four hours a day, three hundred sixty five days a year; Cathedral Canyon was a gift to the world, to be enjoyed by any and all alike. Cathedral Canyon was the dream of a man named Roland Wiley. Originally from Iowa, Wiley moved to Las Vegas in 1929 after obtaining a law degree two years prior. In 1936 he bought the 14,000 square foot ranch in Pahrump where the canyon would later be created. While the area looks flat and featureless, there are numerous small box canyons, mesas, and hills hidden throughout. This inspired him to rename the estate Hidden Hills Ranch. In the 1960s Wiley began the transformation of one of these box canyons into the cathedral, opening it to the public in 1972. It is said that he conceived the idea in 1955 while traveling through Guatemala, where he saw a church that was devastated by an earthquake. The Christ statue is a smaller replica of Christ the Redeemer of the Andes. The original is on the boarder of Argentina and Chile, high in the Andes mountains. 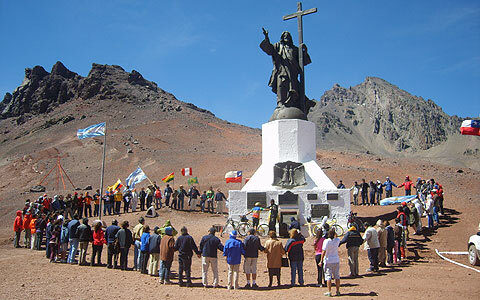 It is visited by pilgrims from all nearby countries and has been declared a National Historic Monument of Argentina. This one, however, seems to be used primarily for target practice now; its torso is peppered with bullet holes and shotgun pellets. I have no doubt that the perpetrators call themselves “Christians,” and are likely completely ignorant of the irony of their actions. At the east end of the canyon was a man made waterfall. Wiley installed a water pump to circulate the water from the small pond up to the top of the canyon where it would cascade back down, transforming the dry walls of the box canyon into a lush grotto. The homage to The Sermon On The Mound can still be made out. In the now dry pond, it appears that someone had made a small bonfire at some point; that was the only sign of altercation to that area, with the exception of natural erosion. I am slightly surprised, in a good way, that the paved walls were not spray painted with graffiti. I did not notice any trace of broken glass anywhere in the canyon. I hope that this is a sign that the stained glass was removed from the canyon and not simply smashed by vandals. One can only hope. This small canyon was and is a templum in the truest sense of the word, a sacred place cut off from the world in honor of the universal, unnamed Spirit understood by all of humanity. While most of the symbolism was Christian, it was clear that there was no doctrine or specific religion being endorsed. It is a shame that future generations will never experience the wonder that was Cathedral Canyon. The only thing not altered at Cathedral Canyon is the grave marker of Queho, The Last Renegade Indian. 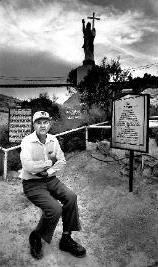 Queho (pronounced Key-Ho) is one of the most fascinating figures of Southern Nevada's history. His father was unknown and his mother died shortly after giving birth to him and his brother, Steve Tecope (Tecope is largely forgotten, as he was said to have lived a peaceful life. However, on July 27, 1931, he fatally shot a Japanese man near Searchlight, NV, and was sentenced to life in prison.2). Their mother is said to have committed suicide by jumping into the Colorado river. Their father was rumored to have been everything from a Mexican miner, a White soldier, to an Arapaho, or Paiute brave. Their mother was a Cocopah, and the only thing all of the rumors have in common is that their father was anything but a Cocopah tribesman. Queho was raised by his mother's relatives on the Las Vegas Paiute reservation. One thing we know for sure is that Queho suffered from a foot deformity, probably clubfoot, that gave him a distinctive gait. This deformity was considered a bad omen by the Paiutes; his physical ailment coupled with his questionable lineage and possibly mixed blood caused him to be an outcast from early childhood. He also had a stepbrother named Avote, or sometimes Ahvote, who was accused of “going on a rampage” and murdering some local Whites. Queho led the hunt for him and killed him. Queho was seventeen years old at the time. Two conflicting accounts say that Queho cut off either the hand (which was unique due to a missing finger, Avote’s most distinct feature) or head of Avote as proof that the fugitive was executed. It is interesting that both stepbrothers were distinguished for having malformed limbs (Queho’s foot and Avote’s finger), and both were wanted murderers. It is said that Queho was an introverted and unhappy youth. Likely, this is how he got the name “Queho,” as in Spanish quejo translates as “complain.” It is unknown when he became known by this name, and his birth name is unknown, as well. No one knows for sure when Queho was born, although he was still a fairly young man in 1910, when he is accused of his first murder. Over the next ten years, he was suspected of at least twenty-three murders and countless thefts, burglaries, and all around mischief. Law enforcement sent out a number of posses to catch Queho, who lived somewhere in the Eldorado Canyon area. All were fruitless. Queho’s name became synonymous with the boogeyman; mothers would use it to scare unruly children. Essentially, any crime committed in Southern Nevada was blamed on him, despite a lack of evidence. Needless to say, he never received a trial for any of the crimes pinned on him, and many, then and now, are skeptical of his actual guilt. There is at least one recorded encounter with him that implies that he was not as evil as the newspapers would have us believe. One afternoon, a local miner came into a clearing near Timber Mountain and there, seated on a rock, his .30-30 rifle across his lap, was the 'ignorant savage' himself. Fred Pine, who had known Queho in Las Vegas, greeted him in his most amiable tone of voice. Queho responded in kind, no animosity in his voice. So they did lunch. Pine dug out a bag of sandwiches, and passed some of them to Queho. When he had finished, Queho told Pine that he, too, wanted to share his lunch, and produced a dried rodent of some sort. Pine gracefully declined. After about a half-hour, he decided to try and make an exit. He said good-bye and walked away, expecting to be felled at any moment. He wasn't. After 1919, he suddenly disappeared. Over the next twenty years, there was no trace of him. 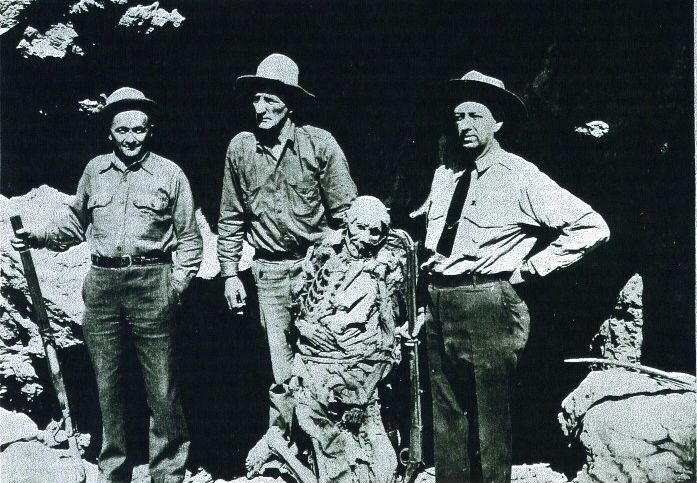 However, in February 1940, his mummified corpse was found in a cave in Black Canyon (near Hoover Dam) by two prospectors. He was estimated to have been dead about six months and had possibly died from a snakebite (one leg was wrapped with a strip of burlap, indicating first aid taken prior to death). That’s when the story gets strange. The mummy was put on public display in a series of places. First, by the sheriff’s department, “for identification purposes,” where anyone who wanted to could gawk at him, and then by Palm funeral home after his remains were eventually turned over to them (interesting side note: Roland Wiley is buried at the Palm Memorial Park). The funeral home put the remains into a glass coffin and stored it on site for about three years. Finally, the Elks Lodge ended up with the body and used it as a display in the annual Helldorado Days Parade. They would drive the mummy in the back of a convertible in the parade and then deposit it in a replica of the death cave, which included many of the actual artifacts from it. After many years of this spectacle, the body and artifacts were stolen from the Elks Lodge and later found in a wash. The artifacts were never recovered. It has been suggested that the theft was a hoax and that the Elks Lodge wanted to get rid of the decomposing remains but did not want to spend the money on a real burial. 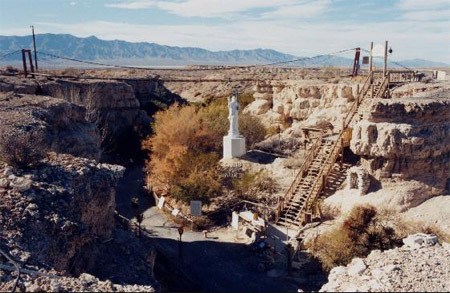 At this time, Roland Wiley, disgusted by the disrespect shown to Queho, bought the remains (now quite literally a bag of bones) for $100, and gave them a proper burial at Cathedral Canyon. But, according to locals, this is not his actual grave. Rumor has it that Wiley erected this memorial at the rim of the canyon, but secretly buried Queho at an undisclosed location elsewhere on his ranch. I am told that the site is marked, but difficult to find. One detail I noticed was that the marker gives the year 1919 as the year of death. Initially, local law enforcement, in an attempt to save face, stated that Queho had been deceased since 1919 and simply lay undiscovered until 1940. We know this to be false. There were items in the cave with Queho's body that dated to the late 1930s, such as stolen blasting caps from the construction crew at Hoover Dam. It is a tribute to Roland Wiley’s character that he gave Queho a final resting place, no matter where it is. Regardless of what crimes Queho did or did not commit during his life, he was still a human being and his remains deserved to be treated with common decency. The epitaph on the marker reads “He survived alone,” and I cannot think of anything more fitting for a man who lived what must have been a difficult and lonely life. Despite the fact that Cathedral Canyon is now in ruins, an empty shell of what it once was, there are still many people who remember its former glory. Even though it is greatly changed, its spirit is untouched. The peacefulness of the canyon is undeniable; whether it naturally arises from the canyon or is just leftover from the goodwill and sacred trappings brought there by Wiley makes no difference. This is still a sacred place, and it will continue to be until the sun ceases to rise and the warm desert winds no longer carry the shifting sands of time. "Blessed Are Those Who Dream Dreams, and Make Them Come True"
So sad... 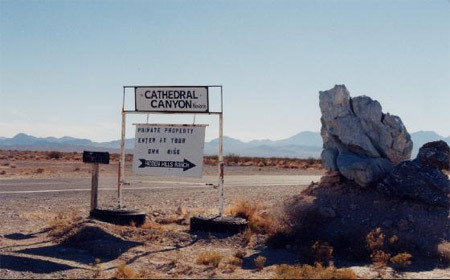 I went to Cathedral Canyon in 1995 and again in 1996... Interesting and magical place it was. Such a shame that it's been destroyed. 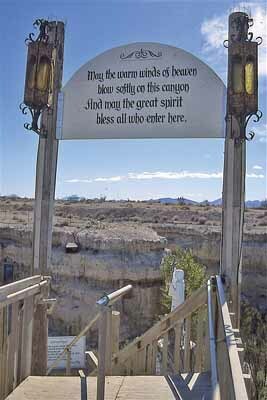 Oh what sadness I experienced when I found this online.I was looking for "prayer found at Cathedral Canyon." I lived in Las Vegas from 1989-1996 and would often stop to visit the site on the way to a hot springs resort. I found there an anonymous prayer on a placard and have quoted this prayer at family gatherings ever since. I am pleased to share this with whomever reads this. Lord, (Oh great spirit of Love,) we thank you for our family and for what we mean and bring to one another. We are grateful for the bonds of loyalty and affection that sustains us and that keeps us close to one another no matter how far apart we may be. We thank you for implanting in each one of us a deep need for one another, and for giving us the capacity to love and to care. Help us to be modest in our demands of one another, but generous in our giving to one another. May we never measure how much love we offer. May we never count the times we forgive. And, that we are able to express our love in acts of kindness. Keep us gentle in our speech. When we speak words of criticism, may they be chosen carefully and spoken softly. May we never waste an opportunity to speak words of sympathy, appreciation, and of praise. And, above all, we pray that you will grant each of us the strength, the courage, and the wisdom to build a joyous and peaceful home in which your loving spirit will always be present. Thank you for putting this information out. I was there back in it's day and fell in love with the place. I had a sister that lived in Vegas and she would drive there on a regular basis. It was her church. I always wanted to take my husband there, but what's the point now. Shame on all those who destroyed it. At least they could have had respect for someone else's property and work. They destroyed something wonderful and meant for the generations to enjoy. Anybody thought about raising funds to at least bring back some small parts of it or at least maybe get some stone carved with the original scriptures?? Thank you for your article, we used to go there as kids and I have wonderful memories of Cathedral Canyon. It's a shame what happened to it. It lives on in our minds and hearts. I wonder if a public entity would buy it now. I believe it is for sale, as is most of the land near it. I have 33 acres not far away that I would be willing to sell. Roland's original ranch has passed to multiple heirs who want to sell if the offer is reasonable. You may contact me ladyelisa1951@yahoo.com with inquiries. I would contact my brother, Roland John Wiley (Roland senior's son).